I am a nerd. Specifically a history nerd. When I was a kid I would immerse myself in history, civics and social studies. And, I still love history. I am a chronic googler and historical documentary watcher. So, it stands to reason that I also have an interest in genealogy. Over the last few years, I have been tracking my genealogy through Ancestry.com. For those of you who don’t know, I am from Puerto Rico. And for a time, I was only able to trace my genealogy back to 1910 because that was the first U.S. Census that was taken in Puerto Rico. Now with the newest release of Puerto Rico’s birth, death and marriage records dating back to 1885 I have been able to track my genealogy as far back as approximately the 1790s! So far everyone is still in Puerto Rico but I am looking for that connection to Spain. Because of my fascination with genealogy I wanted to take it to another level and decided to submit my DNA to AncestryDNA. I discovered much of what I expected and discovered a few surprises. Before I go through the breakdown let me give you a quick history of Puerto Rico. Puerto Ricans are a make-up of several different ethnicities, specifically Spanish, African, Taino (Puerto Rico’s Natives) and Morrocan. We will all have different percentages of these ethnicities but, we will share most if not all of them. If you would like to know your story with AncestryDNA get your DNA kit here! AncestryDNA is a kit that you purchase, and comes with a vial where you provide a saliva sample and ship back for testing. You are provided with a unique code to activate your kit and track your sample. It takes 6 – 8 weeks to process your sample. In laymen’s terms or how I best understand it, AncestryDNA tested individuals in regions that have descendants that can be traced back hundreds of years within that region. They then take your DNA and compare it to those individuals and estimate a percentage of your ethnicity. Learn more about the science behind AncestryDNA here. 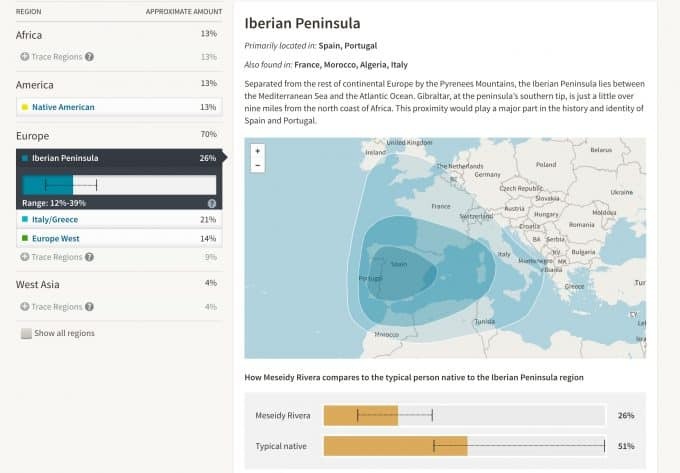 My DNA tells me that I am 70% European, being made up of 26% Iberian Peninsula (Spain & Portugal), 21% Italy/Greece and 14% Europe West which includes France. 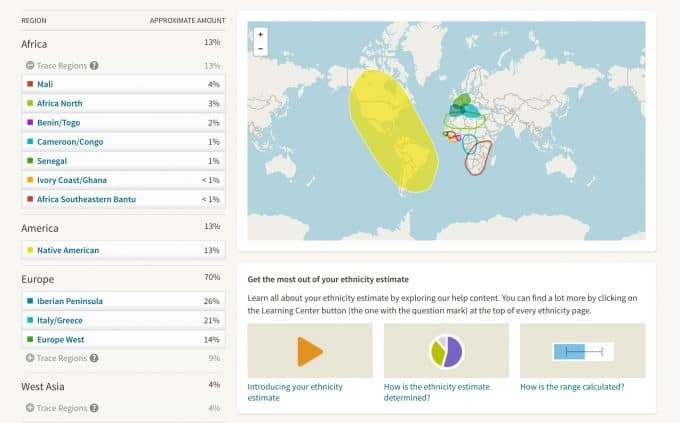 I am also 13% Native American, and 13% African. I also have trace amounts of West Asia (Middle East) and Irish. Keep all of these little bits in mind as I take you through my report because not only will you see my DNA makeup but, also the history of all of these regions and how people migrated through history. Of course, I suspected that I would have DNA that would be traced to the Iberian Peninsula. If you know anything about Puerto Rico’s history you know that the Spanish started colonizing the island in 1493. The people native to the Iberian Peninsula have similar DNA profiles from other nearby reasons like France, Morocco, Algeria and Italy. According to AncestryDNA, approximately 51% of the typical native’s DNA comes from this region. 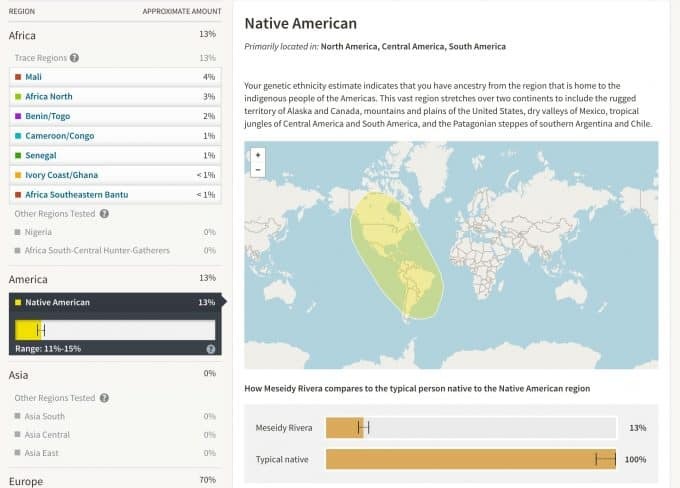 When compared to the typical native which shares 51% of the same DNA I have 26%. The report also provides you with the regions natives of the Iberian Peninsula share DNA. 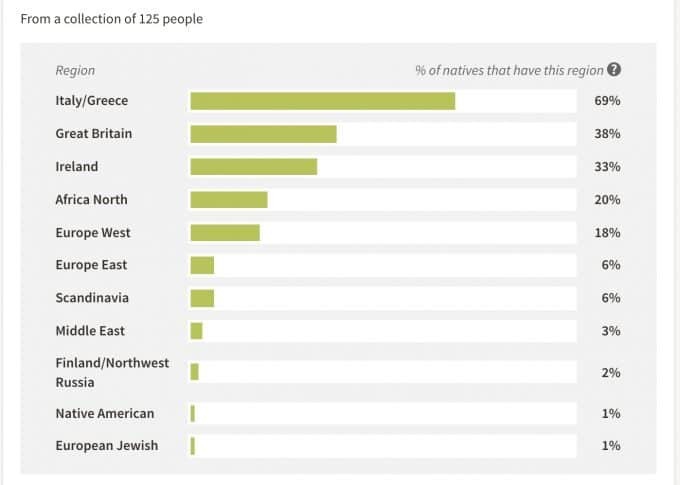 Notice that Italy/Greece, Africa North, Europe West and Native American are listed. All of which were found in my DNA. Initially, this one surprised me but then when I looked at the map and saw who it overlaps with the Iberian Peninsula and North Africa it made sense. You have to remember that DNA not only tells you what ethnicities you’re are made up of but, it will also reflect people’s migration patterns through history. The native people from this region also share similar DNA profiles from surrounding areas, including Spain, Portugal, and France, however, the typical native shares 71% of their DNA. When compared to the typical native I share 21% of my DNA with them. When tracing my genealogy I found that my 4th-great-grandmother’s last name (Feliciana Donis), has French origins! This was the first non-Spanish name to show up in my family tree. When I got my report back and saw that I may have a little French in me it made sense! Also note that this region overlaps with the Iberian Peninsula and Italy/Greece. Most of us who live in the United States hear Native American and automatically think of the Native Americans of the United States but, Native American includes the natives of all of the Americas. Before the Spanish colonized Puerto Rico the island was inhabited by the native Taínos which are the Arawak people who migrated from South America to the Carribean. Unfortunately, with the arrival of the Spanish, the Taíno population went from the thousands to less than 500 due to infections diseases, warfare and enslavement. The Spanish also took on Taíno women as common-law wives and sadly sexual violence against the Taíno women by the Spanish was also common. 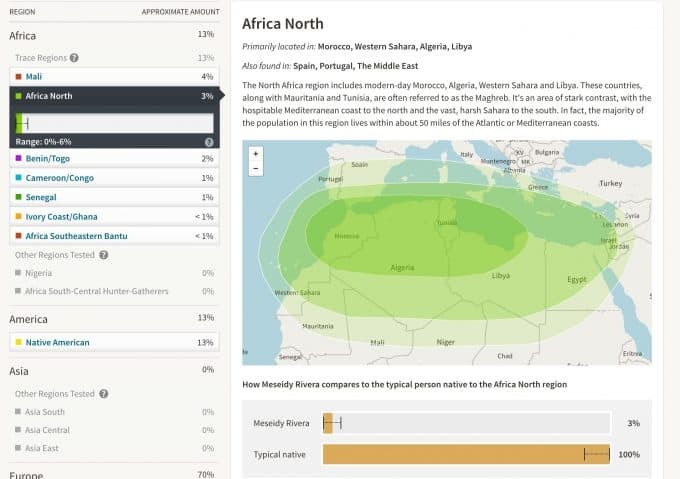 My African DNA breaks down into mainly two parts West Africa and North Africa. With the decline of the Taíno population, the Spanish brought over Africa slaves in 1513. 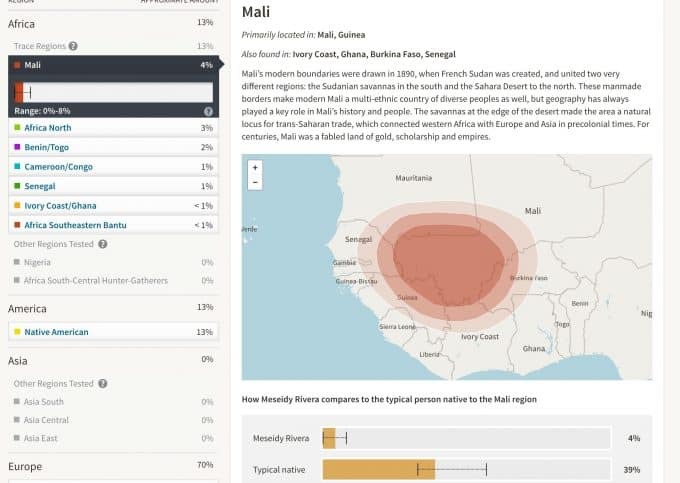 The majority of my West African DNA comes from Mali, which is only 4%. It also includes trace amounts of Benin/Togo, Senegal, and the Ivory Coast/Ghana. There are also trace amounts from other regions of Africa, Cameroon/Congo and Africa Southeastern Bantu. From coast to coast Spain and Morocco are around 40 miles apart. The further south you go in Spain the more influence you see from Morocco. Throughout the 6th century, much of North Africa was under Arab rule.Which probably explains my 4% DNA from the Middle East. Then in the 8th century, nearly all of the Iberian Peninsula was conquered by largely Moorish Muslim armies from North Africa. After centuries-long battles, the Spanish took the peninsula back from the Moors. This time is referred to as the Reconquista. I also have a tiny bit of traces from Ireland 6%, European Jewish 2%, Great Britain < 1%, and Europe East < 1%. I’ll admit I was surprised by the Irish DNA. I guess at some point some Irish descendants made their way to Spain? 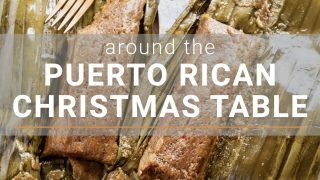 It’s just fascinating to see through my DNA the story of how my family made its way to Puerto Rico. Within my DNA I see the battles of the Moors and Spanish, the migration of people of the Byzantine Empire, the colonization of Puerto Rico by the Spanish, my French 4th great-grandmother and the sad history of the Taíno and African Slaves. 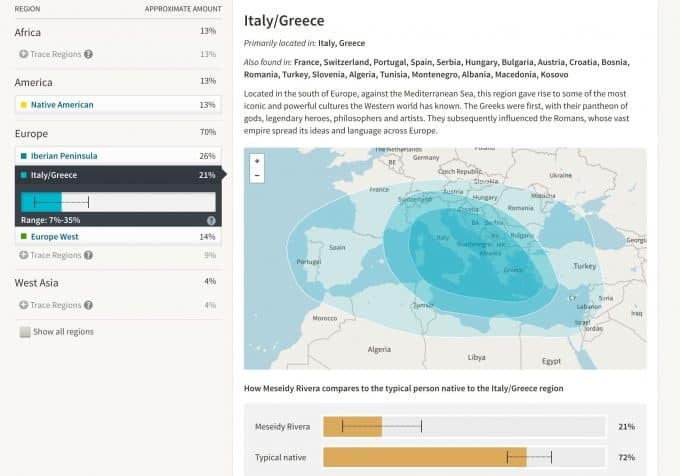 AncestryDNA gives you your ethnicity profile but if you give them permission they will also compare it to other AncestryDNA users to find potential relatives. According to AncestryDNA I potentially have 6000 3rd and 4th cousins. Of course I don’t expect to find the connection but it’s cool to know. They also have DNA circles which are connections through people that you have in your tree. I didn’t have any DNA circles but as they continue to add people I could potentially make a connection. If you would like to know your story with AncestryDNA get your DNA kit here! Are you following me on Instagram, Twitter, Facebook and Pinterest? Want to get some peeks behind the scenes? Follow me on SnapChat @TheNoshery! Though you may be right about regional DNA regarding France, it is important to not that the French Immigrated it is just as likely you have a family member who is French due to the immigration of the French to the island in the late 1700’s-early 1800’s. DNA testing is fantastic stuff! My sister and I barely knew our mother, we were told she was conceived in south Florida and her father was full blooded Cherokee or Seminole Indian. We have done the ancestry test and it came back with Puerto Rican! So we are actually a quarter PR instead of what we were told. I look forward diving in a little deeper to see what else we can find out. Boricua here from Caguas, PR. At least that is what I have always called myself until I took the DNA test. It has turned my head inside out. I too plan to write about this. It is soooooo interesting to me. Just be aware that you may find surprises! I really want to do the DNA test. I was born in PR and both my parents were also born there. One of my grandmother’s was adopted and haven’t really looked into my genealogy but I have always said “I just can’t be Puerto Rican there’s gotta be something more! ” I recently learned of the Tainos and it just kinda made sense. History was also my favorite subject and I love learning new cultures. To see my personal results intrigue me so much! I find these so fascinating! I also was searching for more information about my ancestry, and was blown away by the results. Been a Puerto Rican I was expecting I never thought, in a million years, that I have a 25% of British blood in my DNA. But reading these, plus researching about Puerto Rican history, everything makes perfect sense. Thank you for sharing your history! Thanks for sharing! We have similar dna results although we do not show a match. It’s so interesting seeing results. And yes, I LOVE your PR recipe posts!! It’s interesting enough, but they said while you’re alive they can’t sell or do anything with your DNA. What about after? I don’t think they can clone me for medical experiments….but I can see the establishment trying. They say the royals haven’t taken one. I wonder why? Why are they collecting it? Why are the test so inexpensive? So the poor can afford it? Just a little comment to dismiss the extinction myth about our Taino ancestors. The fact that over 62% of the current population has mtdna of Native American origin shows that many more then just 500 survived. The census in Puerto Rico of 1778 shows a population of 2,800 living in las indieras and mentions another community of about the same size in Anasco. Not to mention the 35,000 individuals listed as Pardo which were the mestizos of White and Indian ancestry. 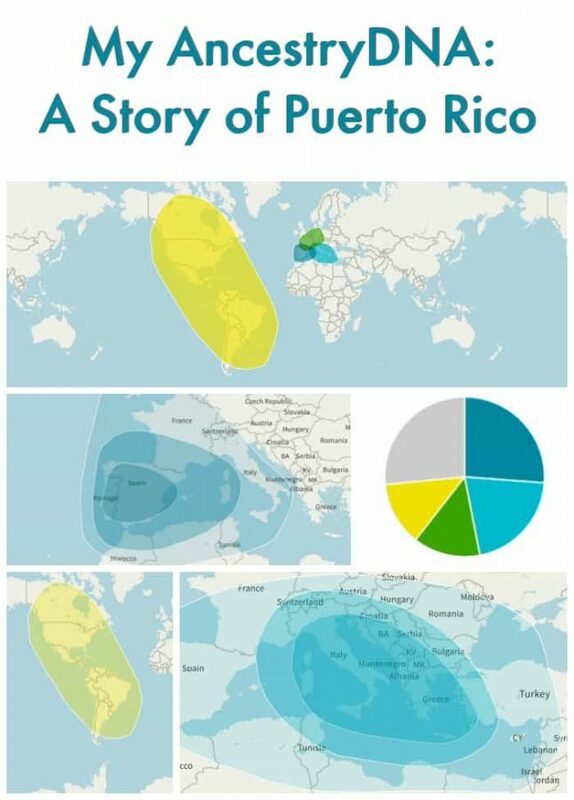 When Autosomal dna test are done on Puerto Ricans today a sounding 80% of the population has Native American dna between 15 to 23% as average range. Studies concluded that only about 8% of these cam from an outside source showing that the majority of Native dna comes from one tribe who were the results of various migrations from Central and South America. Correct…but your native ancestors didn’t “originate” from South America…they migrated over the Bering Strait into Alaska…Canada …and then what is now the United States. So actually your native ancestors were Native Americans of what is now…the United States….who migrated down to Mexico, South America and the Caribbean…some 15,000 years ago. No, actually, we did not. Our DNA is related to the Aussie aboriginals. The Bering Straight crossing theory is Eurocentric colonization history that has been disproven multiple times. Look into a skeleton called Luzia. Omg, you came up as one of my dna matches, I believe you came up as a 5th cousin. I would have to check ancestry dna again but I did see the very same picture you have on this blog on ancestry dna, I know I have the right person. Now, I guess by reading your blog, we are related through my Puerto Rican side. My mom is Puerto Rican, my dad is Cuban. This is so cool! 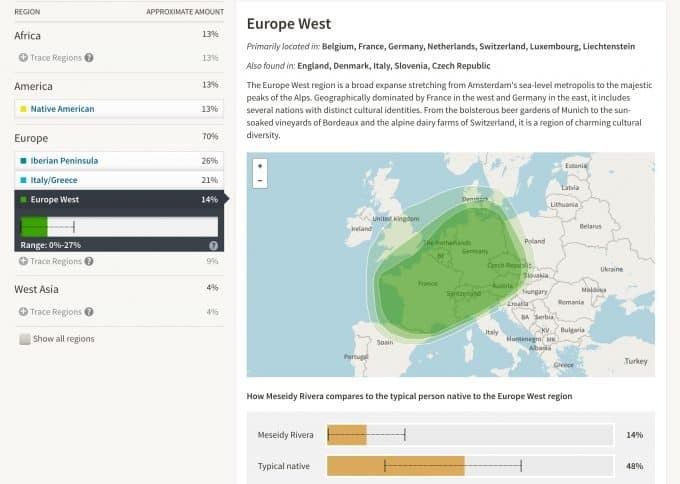 I’m loving this ancestry dna stuff. Just look me up by my last name Encinosa. You should be able to find me very quickly in your dna matches. My concern is the comment about Tainos numbering to just 500 after the conquest when census records show that in 1779 there were over 2,000 living in the Indieras. and mentions that another population of the same size was reported in Anasco. If There were so few Tainos left, there is no way so many of today’s population would have so much Taino DNA from 15% to 23% average, some have higher in over half the entire population. Genealogy research is really fascinating. I wonder if your Irish connection could have come from the time period when Irish workers were brought to Puerto Rico (by the British, I think) to work on El Morro fort. I always thought it was interesting that “Alejandro O’Reilly” and @Tomas O’Daley” were two of the engineers who worked on building El Morro. And then there’s the mayor of Guaynabo, PR whose name is Hector O’Neill – a Puerto Rico native. Irish influence was on the island! Interesting post – thanks. I love these Meseidy! I would love to know how much African and Taino I have in me, because the Spanish part is obvious but I feeel the Afridan and Taino for sure. Thank you for sharing! I have done similar DNA testing and received similar info thru 23andme.com. There are several different companies that offer similar info. 23andme.com also includes medical info as far as risk factors based on your DNA and comparisons to others. You can also participate in surveys that assist with medical research. I am not familiar if these features are available through ancestry.com. I have actually been able to identify several 3rd to 4th cousin and meet one who lives in my area. 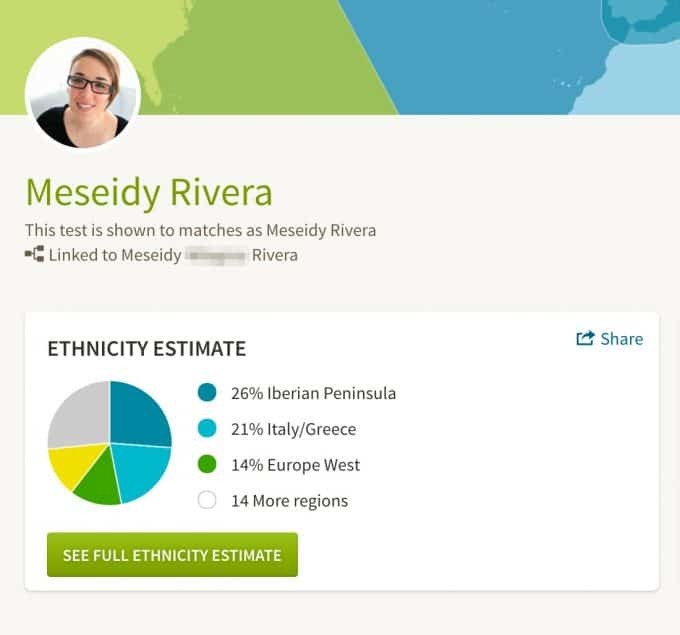 23andme.com also is connected to My Heritage, which can link you to family trees when it matches someone in your family tree, if you choose to post this info. The only problem is that all these different companies do not communicate with each other, so ancestry.com probably may have a number of my DNA relatives as members, but I do not have that info as I am not a member there. It is very interesting to see if your countries of origin match up with your history as passed down in your family’s stories. Mine actually matched closely, however my husband’s held a few surprises! This is so interesting, I knew about ancestry but not about being able to provide DNA with just a sample of saliva!!! I really going to look at it. So much interesting information you can get. Thanks for sharing this. In the other hand, I just want to let you know that I really enjoy your recipes, newsletter and like you I always have to have my plantains available!!! keep up the good work.